Chislehurst is an affluent suburban district, famous for the Chislehurst Caves. 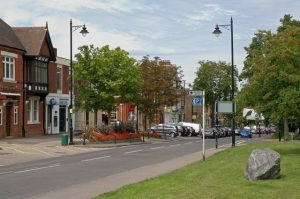 Chislehurst can be reached by car via the A222 and A208. Chislehurst railway station serves the area with direct trains to London. Lanes school of driving was established in 1914 and has been teaching locals to drive for generations. From its inception, Lanes has developed to become one of the largest independent driving schools in the UK. Lanes is well known in the local area for its standards of excellence in driving instruction, grounded by years of experience. Lanes offers driving courses carefully adjusted to suit the needs of each student. Lanes provides for students to arrange bookings according to their own timetables. Students are given the opportunity to learn at a pace that suits them. Contrary to the practices of many of Lanes’ competitors, Lanes is committed to providing one-to-one tuition so that students can progress without the distraction of other students in the back seat. Lanes has a range of brand new and fully equipped cars at our disposal to provide students with the best possible learning experience. Students can arrange for instructors to pick them up from home before each lesson. Lanes have been providing driving lessons in Chislehurst, Kent for many years. Please call us today on 020 8166 5678 or click here to send us an email via the contact page. Lanes is staffed by a team of experienced and highly qualified driving instructors. Every one of our instructors is registered with the DSA as Approved Driving Instructors. It is noteworthy that most of our instructors began their initial training with us. We believe in providing continuity of instruction and each student is provided with an instructor who will remain with them for the duration of their driving course. In our experience this ensures that instructors are familiar with their students’ abilities allowing for more efficient learning. Lanes have a team of driving instructors in Chislehurst, Kent. Please call us today on 020 8166 5678 or click here to send us an email via the contact page. It is often the case that learning to drive can be a scary proposition. We sympathise when women students tell us they prefer not to have a male driving instructor. For this reason Lanes allows students to chose female driving instructors. Our female driving instructors are especially patient and understanding. They will not rush their students or judge too harshly. Our female students often feel the pressure is off when they are paired with a female instructor. A good number of our students chose to learn in an automatic car rather than a manual car. Of course manual cars provide more control. Even so, automatic cars are less intimidating for the beginner, and learning is facilitated. Beginners often have problems with stalling the car. Fortunately it is impossible to stall an automatic car. Furthermore, automatic cars are less complicated to learn on, and students have a much easier time. Lanes have a selection of automatic driving instructors in Chislehurst, Kent. Please call us today on 020 8166 5678 or click here to send us an email via the contact page.